US Tour boss Tim Finchem says the European Tour's new £4.88m ($10m) event will help end complaints that high prize money in America is harming golf. The Dubai World Championship, which will be the sport's richest event, will end the European Tour season from 2009. 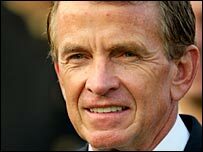 Finchem said: "It's great for professional golf globally. "It reduces the clamour that, because purses on the PGA Tour are high somehow the quality of golf is suffering." In addition to the $10m purse at the season-ending tournament in Dubai, the top 15 players in the European Tour's Order of Merit, which will be renamed the Race to Dubai, will share a further $10m. The European Tour hopes the big jump in prize money will stop talented young Europeans moving to the US Tour, where the financial rewards have traditionally been greater. Finchem believe the cash injection shows it is possible for golf to match the money available in international team sports. "It sends a message that slowly but surely professional golf is making strides to keep up with or gain on team sports," he added. "World class athletes should be compensated at the same level as team sports - I've said that for 12 years."